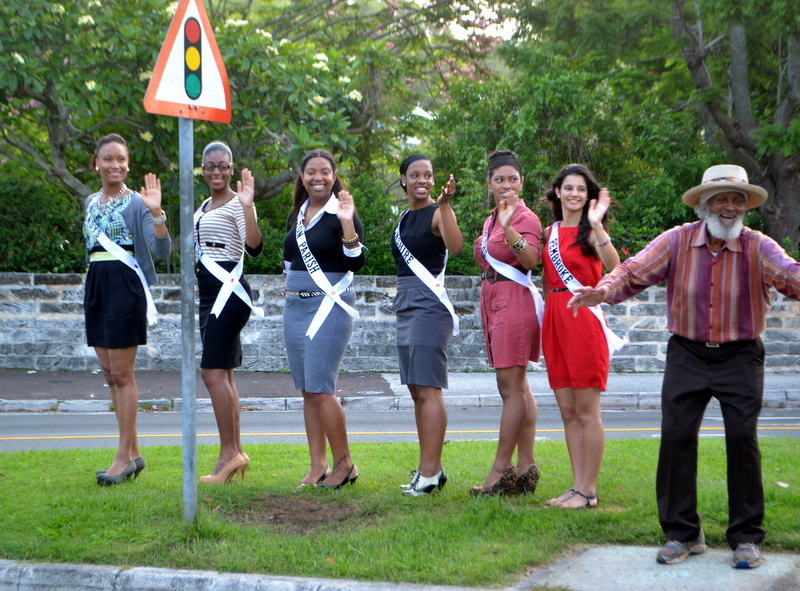 With just under two weeks until the new Miss Bermuda is crowned, the contestants continue to prepare and make appearances in the community, and were out this morning [June 27] greeting morning commuters alongside Johnny Barnes. Under the direction of Milika Trott Seymour, the Miss Bermuda Pageant was brought back last year after a hiatus of over a decade. Last year’s winner represented Bermuda at the 2011 Miss World Pageant in London, and the winner of this year’s pageant will travel to China to compete in Miss World. There are eight competitors vying for the chance to be crowned Miss Bermuda 2012; Deshona Perinchief, Lene Hypolite, Chelsy Furtado, Dwanae Simons, Dashunte Furbert, Shannon Ingram, Rochelle Minors and Crystal Lyn. The 2012 Miss Bermuda Pageant is scheduled to take place Sunday July 8th, at the Fairmont Southampton Hotel.Tickets are on sale at bdatix.bm, starting from $65. Why is the DoT funding this trip to Mongolia when we are supposed to be attracting vistors here? Is the DoT now in the business of paying for Bermudians to travel worldwide in the hope they catch someone’s eye? How many vistors have flooded here following last year’s appearance in Miss World by Bermuda? The organisation appears to be a joke considering how many entries there are this year, especially after the evnts of last year, but good luck to the 8. What exactly are you a “supporter” of? You sound like the same person who comes on here everytime there is a pageant related story talking the same negative mess. We only have 9 parishes and there will be only one winner so does it really matter that eight contestants have made it thru? I personally know many women who would have liked to participate but couldn’t because they kids or had other conflicting obligations. Clearly you must have personal issues with the organizers of the pageant because no logical person could fault the Department of Tourism for supporting a positve community event such as this. It makes perfect sense that would help send the next Miss Bermuda to Miss World, after all she will be representing our country overseas. You obviously aren’t aware that the current Miss Bermuda (Jana Outerbridge) has made appearences at international travel market events to promote the island as well as the highly successful Bermuda Day in Grand Central station in New york, which did in fact bring many visitors to the island who may not have othewise come. Last year people were complaining when the DOT didn’t support Miss Bermuda but now that they are contributing it’s a problem? I guess it’s true what they say, you can’t please all the people all the time…..
@ K.T.B. I am a supporter of events and efforts that contribute to local community improvements. I also support those who can show they have the ability or skills to compete on the world stage. In this instance, Bermuda lacks any contestant in 2012 with the skills, ability or looks needed to compete on the World stage. To do so is to waste money and resources and is not something the DoT should sponsor. Keep this Pageant as a local event. Miss World today has very little in common with Miss World 1979. Im just wondering, do the people that put this on realize that the winner will go on to compete in miss universe. Have they seen the contestants in miss universe? Do you see miss universe in this line up? I think not! Sorry ladies no diss but its like a guppy tryna fight a great white, its just no chance in winning. Where is miss southampton? My $ is on her, you see her on the street on a regular day and she takes ya breathe away. people have to know what they CAN and CAN NOT do …know your limitations. Hope the winner has enough money, so you can travel to the next competition.i think it is said when you have a contest such as this and you (the winner) has to pay for everything yourself. What did she pay for herself? It certainly wasn’t her plane ticket, hotel accommodations, food/beverage, any of her casual overseas wardrobe (sponsorsed by A.S. Coopers) or her many competition gowns (Blanc bridal) was it? Please try to rise above being a ignorant pot stirrer and come with some facts. Unfortunately this picture does not do anything for most of the contestants. With the amount of young women having children this pageant may find itself in a diffucult position attracting young women not withstanding that most “Bermudian” women are attractive. I think Ms. Hypolite has a GREAT chance of winning!!! Beauty will not be a factor when you stand before the judges!